Rentals for residential property may go up under the GST regime as the cost is likely to increase under the GST regime. thus, while there will be no output tax on these services, it is important to understand whether the changing indirect tax scenario under GST regime is likely to have any impact on the rentals. Purchase of a residential premises under the existing regime attracts a Service tax of 4.5% for a flat whose value exceeds INR 1 crore and 3.75% of the value of the flat whose value is upto INR 1 crore. In addition to this, purchase of a flat attracts a VAT of 1% in certain states like Maharashtra .As opposed to this, purchase of a residential property under GST regime is likely to attract 12% GST (being a summation of 6% Central GST and 6% State GST). This is because under the current regime there are restrictions in availment of credits whereas under GST a developer would be eligible to avail entire credits on procurements. Such increase in/ additional credits, in a city like Mumbai, is likely to be around 2 to 2.5% of the cost of the property. Under the existing service tax legislation, the negative list of services (i.e. the list of services on which service tax is not leviable) includes renting of residential dwelling for use as residence However, in the midst of such litigation in this sector, one consistent factor has been the non-levy of service tax on renting of residential property. 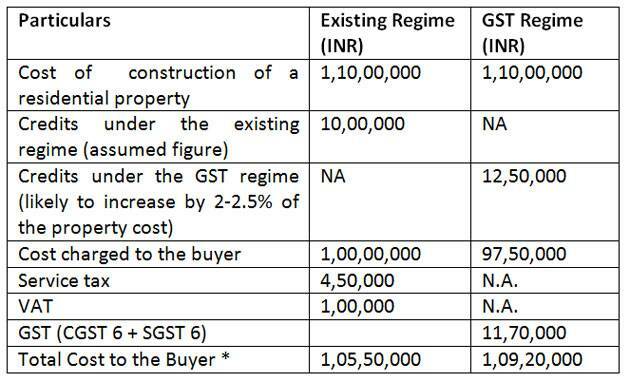 1 Comment on "No GST FROM RESIDENTIAL PROPERTY INCOME"